SAM Labs' wireless electronics components allow you to make interactive projects without the tedious parts. You just charge up the components, attach them to projects and wire them together using graphical software. This simple approach means that SAM Labs' is accessible to older kids, tweens and teens as well as less-technically skilled families who still want to make cool stuff. Disclaimer: We met up with SAM Labs at the London Toy Fair and they have sent us some of their kits and components to try out in our projects. The views in this article are our own. Each SAM Labs component has a specific function. There are input SAMs like the button, light sensor, tilt sensor and proximity sensor, and output SAMs like the motor, servo and RGB LED. Unlike most electronics sets SAM Labs components don't need to be physically wired together. This is because each component has power, control and connectivity bundled into a small package. The components use Bluetooth for wireless communication. SAMs are 'wired' together using graphical software. SAMs can also be connected to internet services such as twitter for Internet of Things style scenarios. With other electronics approaches, keeping everything physically (and electrically) connected can be a challenge. The idea of being able to put each component where it's needed is very appealing. Most of the components are around 3cm square and 1cm high. The key electronics component is visible on top and a silicon cover protects the SAM and makes the component easier to work with. Each SAM has a micro USB port for charging, the SAMs must be individually charged. We ended up with a few USB cables in a hub and swapped SAMs over after they has been used for a while. 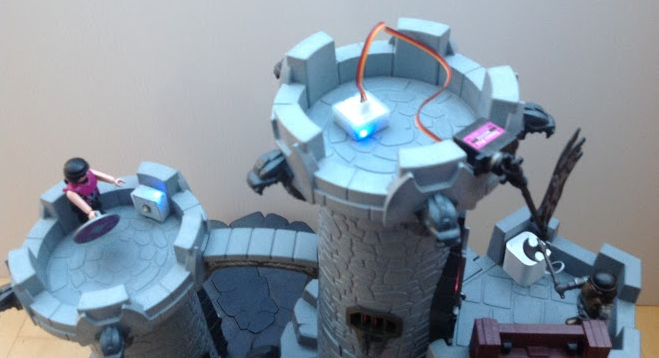 The sensors stay charged for much longer that the servo and motor as you would expect. It was a slight pain to have to charge the SAMs individually but not a big deal. The SAMs turn green when fully charged but can be used before this if you can't wait! To turn a SAM on (or off) you have to press a tiny switch through the silicon cover. This is a bit awkward and my kids found it tricky. 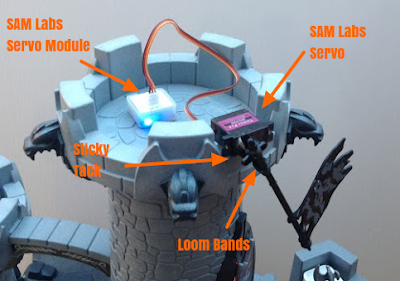 There's nothing that particularly helps you to physically attach SAMs to projects but we've found that sticky tack and loom bands get you a long way! These approaches are reversible which is important as you'll want to reuse the SAMs in different projects. SAM Labs have starter projects for the various kits which you get access to when you purchase them. 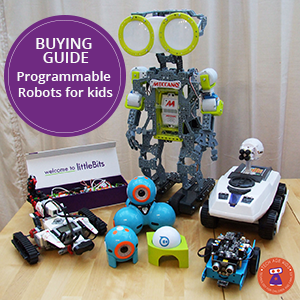 The SAM Inventor and SAM Learn kits have multiple projects to help get you started. 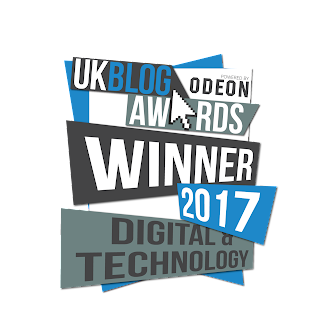 This is useful as it's good to work through some guided activities to find out what the technology can do. Alternatively, it's pretty easy to just start wiring SAMs together as my 7 year old did. You can create an account and have your projects saved to the cloud which is very convenient. You can also view sample projects including those from the kits you have bought. The software is graphical and you just drag SAMs and software components and wire them together. The software itself has some nice features such as being able to use 'Sleeping SAMs' which are components that you either don't have or don't have turned on at the moment - you can later drag a 'Live SAM' over the sleeping one. Navigating around the software is a little clunky and there is room for improvement in future versions but the basics are straightforward. The software automatically detects SAMs that are turned on and makes them ready to use. 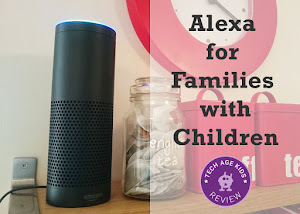 Everything went smoothly the first time we used it and it detected the SAMs that were turned on and my 7 year old was soon wiring things together. 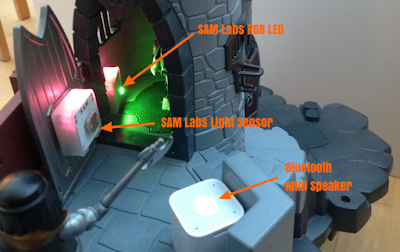 Each SAM has an RGB LED inside (separate from the main LED on the light SAM.) The software is colour coded so that SAMs that are connected are the same colour in the software and their LED is set to the the same colour. This is very intuitive and makes it easy to understand how projects are connected, especially if you have multiple of the same SAM. 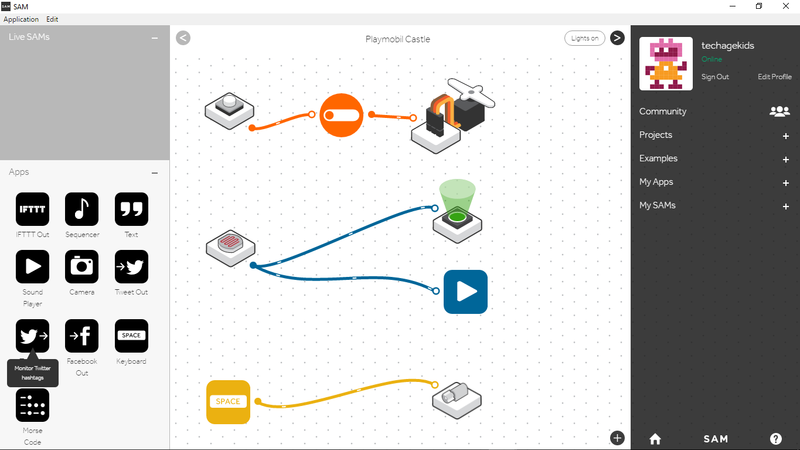 The SAM Labs software uses a drag and drop node and connector model. Inputs are wired to outputs to trigger them and other behaviours can be added along the way. This works well for the SAM components. It's good to expose kids to something other than graphical block or text based sequential coding. "Mum, can I connect two things after the button?" The basic functionality is really straightforward to use. You can do quite a lot with inputs triggering outputs. 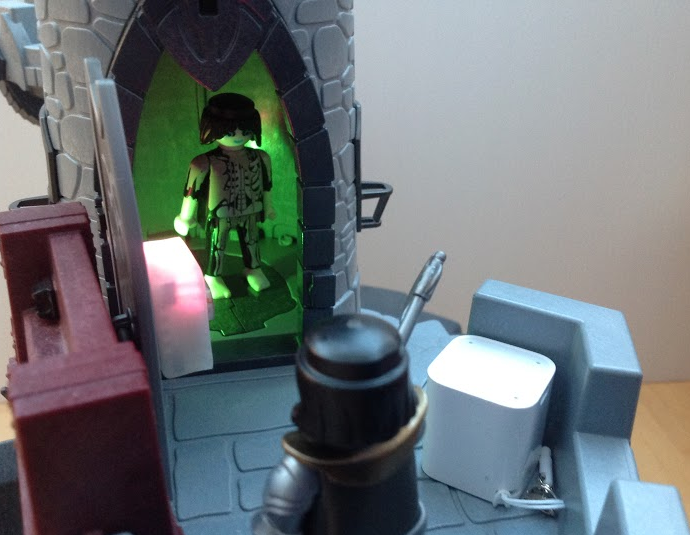 We did three mini projects using SAMs all set in a Playmobil castle. Here's the result, read on to find out how we did it. 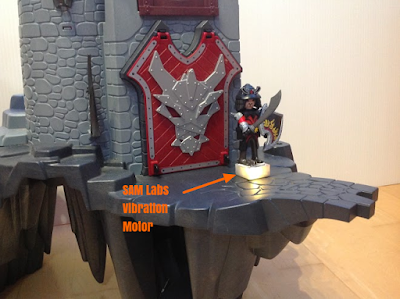 The servo SAM was perfect for raising a flag at the top of the tower. We attached the flag using loom bands and set up a SAM button to toggle between the raised and lowered positions. The SAM button to control the servo is over in another tower with no wires connecting the components. It could be much further away and still work. The 'code' for this mini-project is simple but powerful. If you wire the button directly to the servo then the servo will turn while the button is pressed. But my son wanted the flag to move from a down position to an up position. We found that we could add a toggle which would alternate the position between up and down on each button press. At first the flag wasn't straight when it was up, but by double-clicking on the servo we could easily adjust the angle of the up position until we got it right. The 'code' is a again very simple. When the door is opened more light reaches the light sensor and it triggers both the light module and the Sound Player app in the software. To set the colour of the light you just double click and use the colour picker. The Sound Player app has some included sounds or you can upload your own. Note that the SAMs have less bright LEDs inside which are on even when the door is closed. 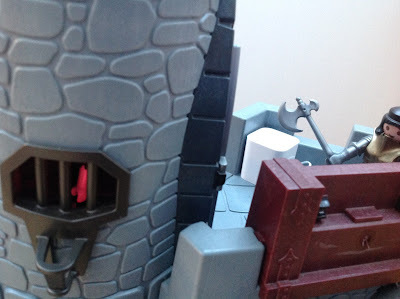 You can turn these off in the software, but my son liked being able to see a reddish glow through the side window of the castle when the door was closed. You can see that the green light is off when the door is closed. We found that a Playmobil figure fits nicely on the vibration SAM with a bit of sticky tack to temporarily hold it in place. The vibration motor always goes in the same direction so the figure just moves one way. The vibration SAM was turned on while the space key on the keyboard was pressed - this way it can be controlled accurately so the figure doesn't fall off! This time, instead of using a SAM module to trigger the vibration module we used a SAM software app which triggers when a key is pressed on the keyboard. It was great not having to worry about wiring things together or to a battery pack or processor. Sticky tack and loom bands meant that we could quickly secure components and remove them after play. 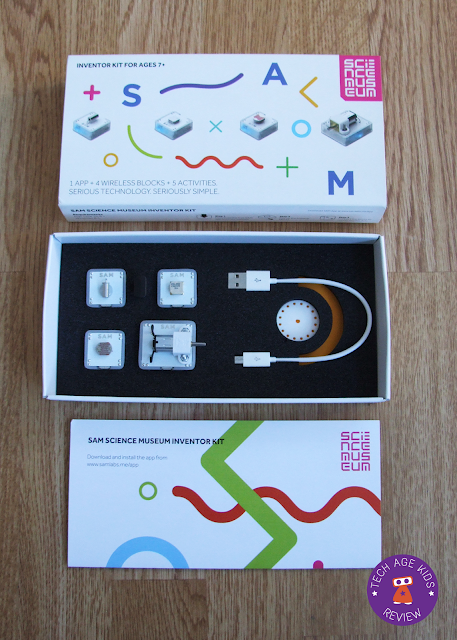 The SAM Labs packaging looks smart but we didn't find it useful for storing the SAMs away in between uses. It's too fiddly to open and close the packaging and the cardboard doesn't look like it would stand a lot of use. A plastic toolbox is much more convenient for storage. Of course when you're using SAMs regularly then they will be in use in projects or on change, not packed away in a box. But it's good to have a home for them in between projects and when you're just trying things out. The SAMs are fairly small so you need to keep track of them. SAM Labs isn't cheap. It's quite an investment. This reflects the wireless bluetooth and control capability that is in every single SAM. This is the feature that makes SAM Labs. It's also the one that makes it expensive! The wireless feature really enables projects that would be difficult to do otherwise. 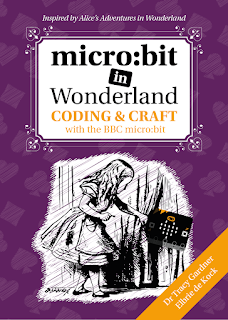 It releases kids from having trailing wires and working out how to fix multiple components in a small place when they only really need the output component there (been there, done that!) For projects that need this flexibility SAM Labs makes alternatives seem clunky. It also opens up possibilities that you wouldn't bother trying with other technologies. 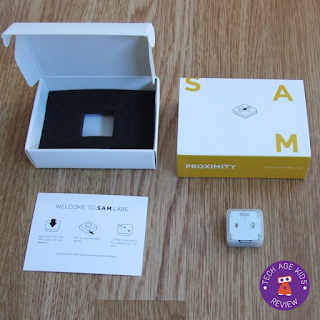 We've used a mini bluetooth speaker and a mini remote keyboard alongside SAM labs to achieve more with inexpensive components that we already have that work really well alongside the SAM components and can interact with the software. SAM Labs is a great technology for maker families to have around. 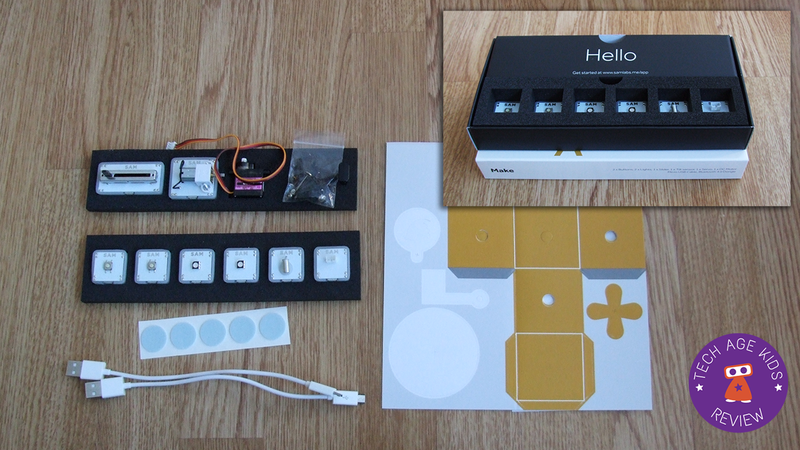 It allows kids and tweens to quickly add electronics and IoT connectivity to their projects. Teens will enjoy building projects that interact with social media, and it's a practical way to prototype IoT projects for the whole family. The wiring based graphical coding exposes kids to something other than sequential block-based languages. Doing simple things with SAM Labs is simple. We'll look at the scope for doing more complicated things in a future post. SAM Labs is very accessible for beginners. It will appeal to a wide range of ages with younger makers working alongside parents on projects. Which Kit for Getting Started? The best kit for your family will depend on the kind of projects you want to make. If you want to use SAM Labs with under 10s then we like the SAM Labs Learn Kit. This includes a Servo which is easy to use and understand and gives kids a practical reason to learn about measuring angles in degrees! It's also got a colour RGB LED which is always a hit with kids. If you add in a bluetooth speaker or just use sound from a computer then you've got motion, light and sound and can create some really cool projects without too much complexity. You can add other components like a light sensor or proximity sensor later. Pros and cons vs littlebits? Great question. We love littleBits too. I'll put together a detailed comparison at some point. 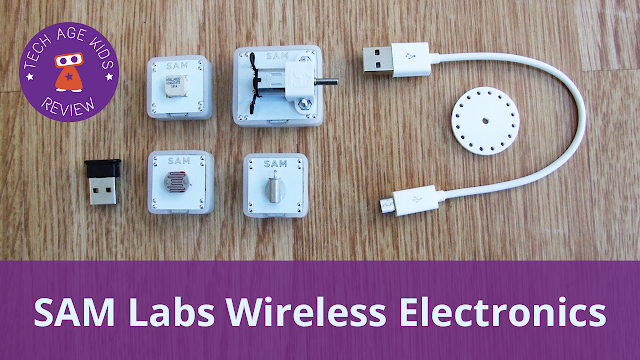 Basically SAM Labs gives you the freedom to make projects with multiple wireless connections. With littleBits you do spend a lot of time figuring out the best way to physically connect things to make your invention work. Having everything rechargeable is really practical too. SAM Labs makes software part of the default experience. You can code littleBits in various ways but it's not default capability, you need specific bits. The extra capability in every SAM obviously puts the cost up.